New York State is seriously considering the legalisation of medical marijuana. a bill proposing to do that has cleared a committee in the New York State senate, which will havea chance to debate and vote on it, according to the New York Daily News. Around half of New Yorkers tell pollsters that they favour the legalisation of marijuana, which was made illegal under the Harrison Act of 1937. What makes the discussion in New York interesting is that it is openly being discussed in conjunction with concerns about New York State's looming budget deficit, which is so serious as to have delayed the maiing of tax refunds to New Yorkers. Any system of dispensing medical marijuana would be heavily regulated and taxed. Legislators are salivating at the prospect of millions that is now being spent on marijauna being subject to taxes. There is a major problem with illnesses being discovered and created that "require" marijuana. Additionally, there is the question of testing for marijuana in the blood of impaired drivers. While no one begrudges the terminally ill the means to ease their pain, it is highly likely that a lot of abuse will be facilitated by an expansion of marijuana legalisation. Will New York's budget woes speed the legalisation of medical marijuana? I am fearful of drug abuse making new inroads if medical marijuana is made available without proper safeguards. If medical marijuana is made available, New York City may gain the anomalous status of being friendlier to marijuana than to tobacco. I hope that legislators don't let the smoke get in their eyes when they are discussing the budget deficit. Any provision of medical marijuana should contain safeguards to prevent its recreational use. The well being of New Yorkers should not be held hostage to the budget deficit. This bill should be approached with caution. 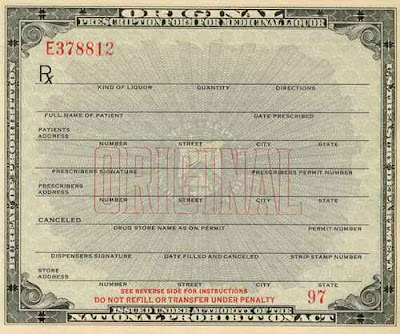 The illustration with this article is of a prescription for medicinal alcohol during Prohibition, a time when marijuana was legal under federal law and alcohol was not.